Aquatic therapy allows people of all ages and levels of function to reach their goal, to return to what they love to do. For those with difficulty moving, water offers a gentleness that provides reduced stress on joints and muscles; great for post-operative joint replacements. Our program utilizes the principles of buoyancy, resistance, hydrostatic pressure and incorporates the special properties of exercise in the water with individualized attention to each patient. Specialized pool equipment, warm water and specific programs in coordination with the Physical Therapist’s plan of care will facilitate each patients rehabilitation. 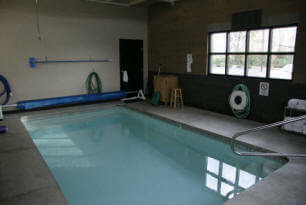 Aquatic Therapy is well-known for its fun atmosphere while also being beneficial to their recovery.